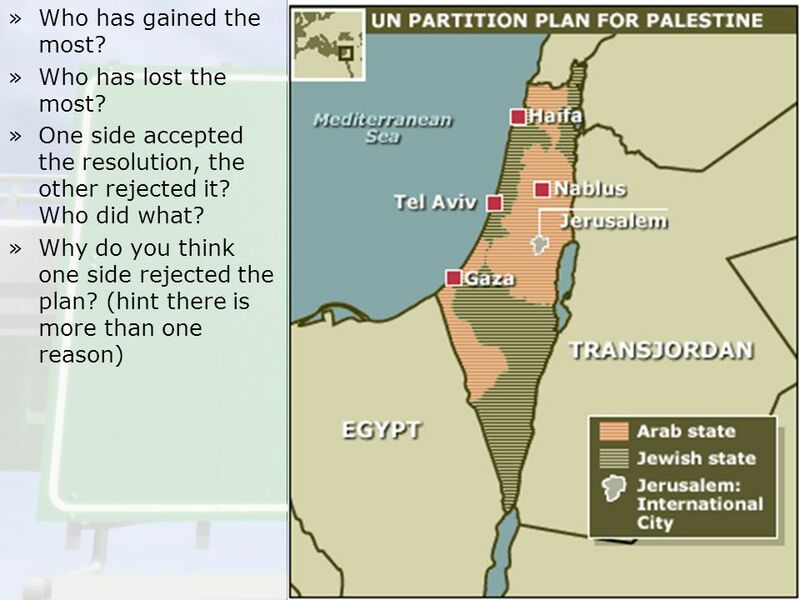 The plan called for the partition of Palestine into an Arab and an Israeli state. 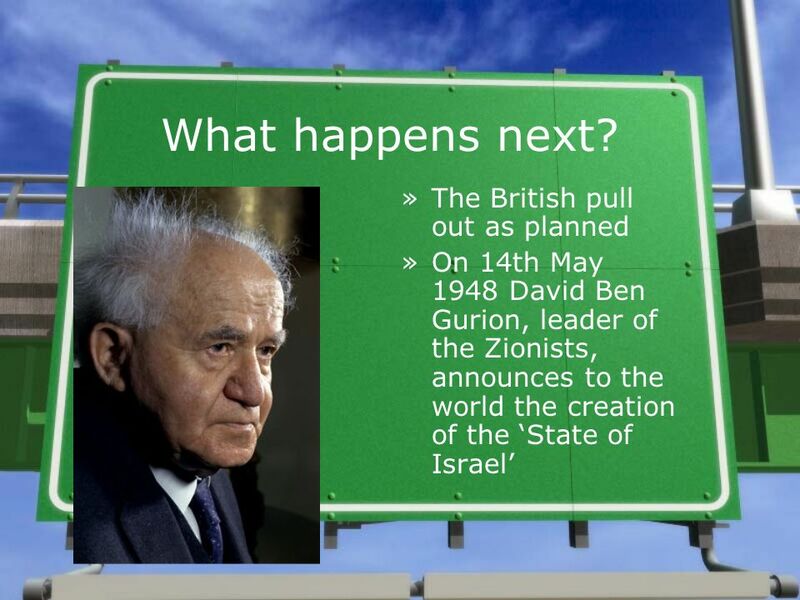 This was to occur by 1st August 1948 at the latest. 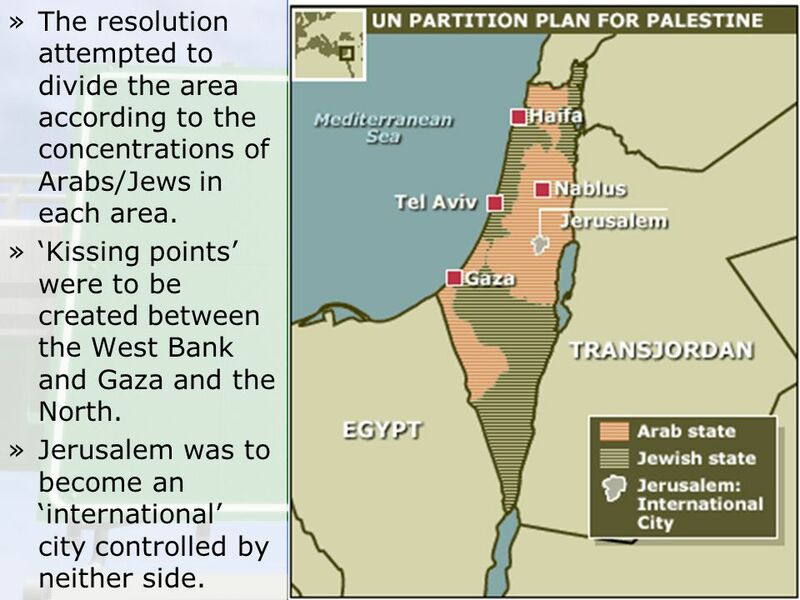 3 The resolution attempted to divide the area according to the concentrations of Arabs/Jews in each area. 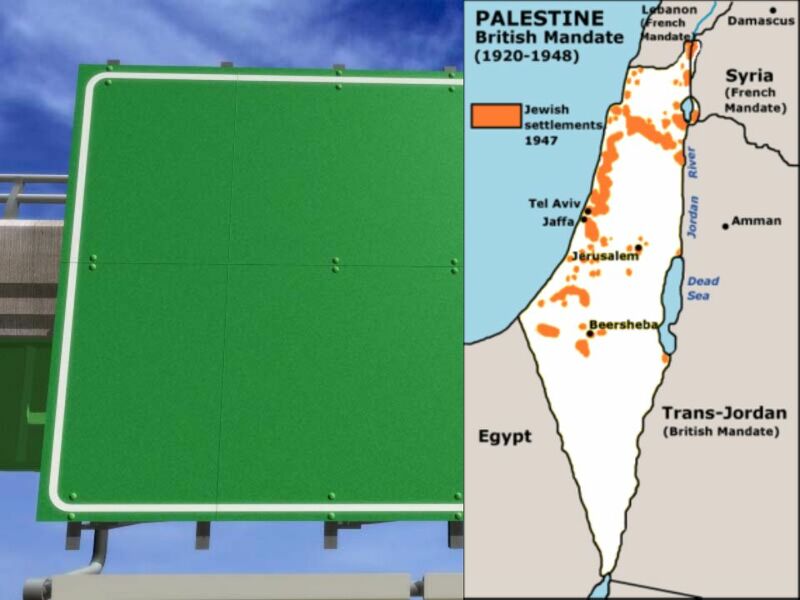 ‘Kissing points’ were to be created between the West Bank and Gaza and the North. Jerusalem was to become an ‘international’ city controlled by neither side. 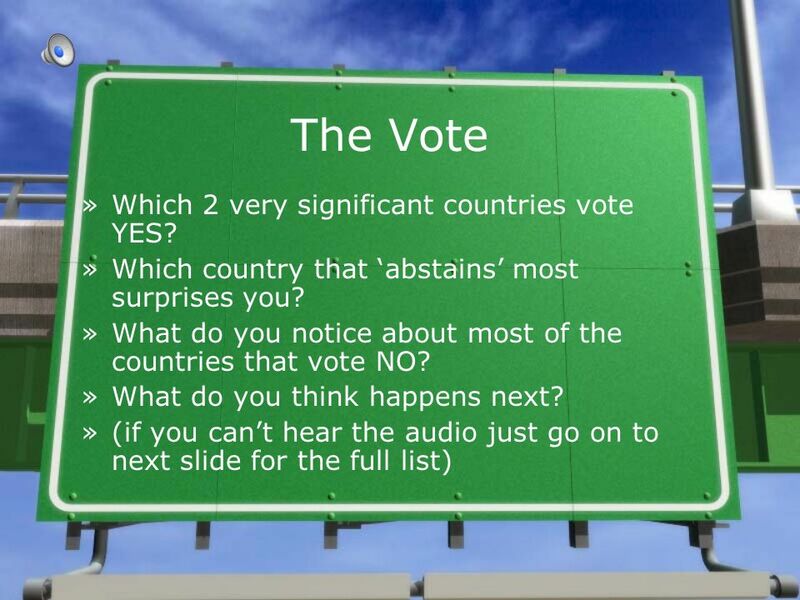 6 The Vote Which 2 very significant countries vote YES? 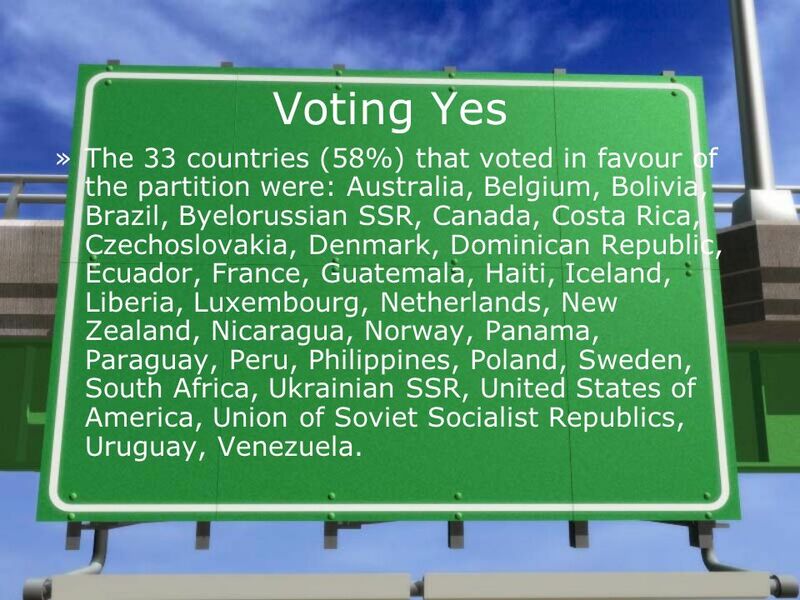 7 Voting Yes The 33 countries (58%) that voted in favour of the partition were: Australia, Belgium, Bolivia, Brazil, Byelorussian SSR, Canada, Costa Rica, Czechoslovakia, Denmark, Dominican Republic, Ecuador, France, Guatemala, Haiti, Iceland, Liberia, Luxembourg, Netherlands, New Zealand, Nicaragua, Norway, Panama, Paraguay, Peru, Philippines, Poland, Sweden, South Africa, Ukrainian SSR, United States of America, Union of Soviet Socialist Republics, Uruguay, Venezuela. 8 Voting No The 13 countries (23%) that voted no were: Afghanistan, Cuba, Egypt, Greece, India, Iran, Iraq, Lebanon, Pakistan, Saudi Arabia, Syria, Turkey, Yemen. 9 Abstain The 10 countries (17%) that abstained were: Argentina, Chile, Republic of China, Colombia, El Salvador, Ethiopia, Honduras, Mexico, United Kingdom of Great Britain and Northern Ireland, Yugoslavia. 11 What will be the reaction of the Arabs in Palestine and Israel's Arab neighbours? Download ppt "So what was the plan? 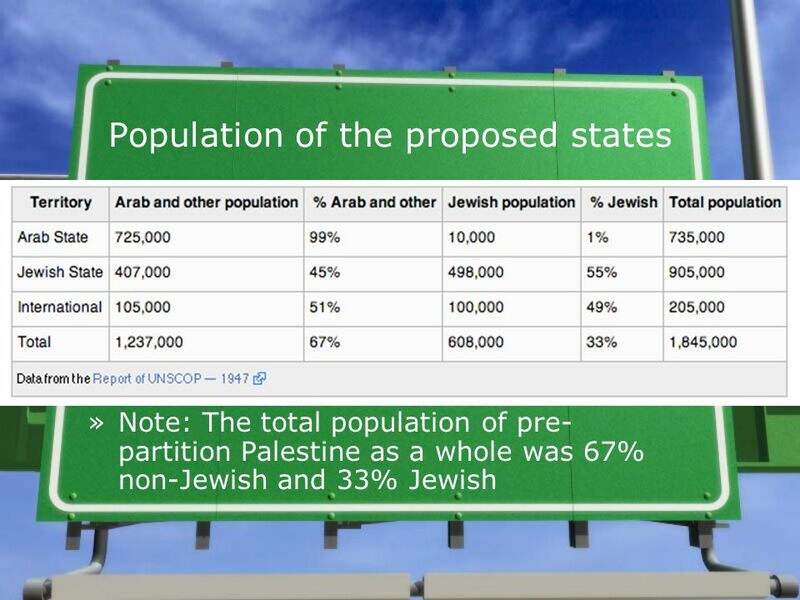 UN agreed resolution 181: the UN partition plan"
National RV introductions by WHO region: 51 countries* AFRO Botswana Burkina Faso Burundi Ethiopia The Gambia Ghana Malawi Rwanda South Africa Tanzania. Miscellaneous – Regions, Locations and Places Part IV. Sida’s Humanitarian Work. Sida’s Strategy for Humanitarian Work Based on the Government’s Humanitarian Policy (2005). Aim: Save lives, alleviate. The Bretton-Woods Conference June Founders Harry Dexter White - Chief International Economist at the U.S. Treasury Harry Dexter White - Chief International. © Hague Conference on Private International Law The Hague Conference on Private International Law HCCH HCCH. The League of Nations ! By: Abby ! !. What is the league of nations !? The league of nations was an organization used to help encourage international. Where Is the World’s Wealth? The World’s GDP WORLD65,950,000,000,000 U.S.13,130,000,000,000 EU13,060,000,000,000 CHINA10,170,000,000,000 JAPAN 4,218,000,000,000. Latin American Countries Map Review. Mexico Nicaragua Panama Colombia Haiti Puerto Rico Jamaica Honduras The Bahamas Cuba United States Belize Guatemala. DISPUTE SETTLEMENT On the eve of its 15th “birthday”, the World Trade Organization (WTO) earlier this month reached the milestone of having the 400th trade.